Rome (AFP) - Italy's far-right Interior Minister Matteo Salvini on Sunday told foreign charities to stop rescuing migrants off Libya even as one group said 1,000 people were on boats in distress in the Mediterranean. With Italy -- long the frontline in Europe's migration crisis -- vowing a new hardline stance, Salvini told the aid groups to back off and let the Libyan coastguard take care of rescue operations. "Italian ports are and will be closed to those who aid human traffickers," he said. 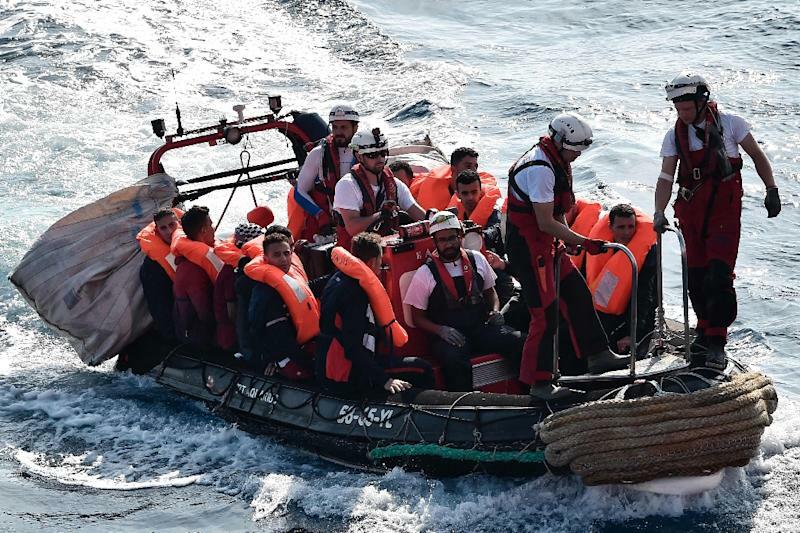 Spanish group Proactiva Open Arms said it had received "seven or eight" messages alerting them to boats in distress in the Mediterranean on Sunday. "Combining all the notifications, it would add up to 1,000 people" near the coast of Libya, spokeswoman Laura Lanuza told AFP. But she said the Italian coastguard had told the group they "weren't needed" and "the operation was being handled by the Libyan coastguard". "If the Libyan coastguard coordinates this effort, all these people will be sent back to Libya," she said. Late Sunday, Salvini tweeted that the Libyan coastguard had rescued "820 migrants" and once again took aim at NGO ships. "I would like to express my heartfelt thanks, as a minister and as a father, to the authorities and the Libyan coastguard," he said. "Today they saved and brought 820 immigrants back to Libya, making the "work" of the traffickers in vain and avoiding wrongful interventions by NGO ships." Earlier Sunday Barcelona mayor Ada Colau had called on the Spanish government to save the migrants in distress. "Right now more than 1,000 people adrift in seven boats and Italy intends to leave them in the hands of Libya, where people are tortured, raped and enslaved," she said on Twitter. She urged her own country to "help save lives" and said the migrants could would be welcomed in her city. "Barcelona is offered as a safe harbour." In recent weeks, Italy's new populist government has cracked down on foreign rescue ships operating in the Mediterranean. Rome once played an important role coordinating rescue missions but Salvini wants to drastically reduce Italy's involvement. Two other ships carrying hundreds of migrants -- the German NGO ship Lifeline and Danish container ship Alexander Maersk -- are currently in the Mediterranean awaiting instructions on where they will be allowed to dock. Salvini's refusal to welcome the rescue ships has thrust immigration to the forefront of the EU agenda. On Sunday EU leaders held a mini-summit on the issue.